Religion: catalyst for violence or peace? 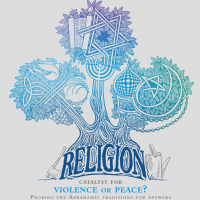 Registrations are now open for the 2015 eConference ‘Religion: Catalyst for Violence or Peace? Probing the Abrahamic traditions for answers’ on Tuesday 23 June. The 2015 eConference is a joint initiative between the Broken Bay Institute and the Australian Catholic Bishops Conference. The event will tap into interfaith issues surrounding the three Abrahamic traditions: Christianity, Judaism and Islam. The aim of the eConference is to explore the potential for these traditions to cultivate peace in a world that associates Religion with violence. We live in a time when some people have come to consider religion as a cause of division rather than a force for unity. Recently Pope Francis said, ‘For inter-religious dialogue and encounter to be effective, it must be grounded in a full and forthright presentation of our respective convictions’. Through such courageous dialogue ‘new avenues will be opened for mutual esteem, cooperation and indeed friendship’. Mohamad Abdalla, Associate Professor at the School of Humanities, Griffith University, Queensland. Amy-Jill Levine, Professor of Jewish Studies, Vanderbilt Divinity School and College of Arts and Sciences, Nashville, Tennessee, USA. Dorothy Lee, Dean of the Theological School and the Frank Woods Professor in New Testament, Trinity College, The University of Melbourne. Terry Lovat, Emeritus Professor and Postgraduate Theology Convenor, University of Newcastle and Senior Research Fellow, Philosophy, Religion & Education, University of Oxford, UK. The eConference is free to watch but registration is mandatory. You can register for the eConference on any computer, mobile or tablet device. After registering, it is recommended that you test the video and audio using the system test (see below) on the device you are going to watch the eConference on. This year, the eConference is also available to watch on iOS devices (e.g. iPhone and iPad). Please use one of the links below to register. You only need to register once. To register for the eConference, please click here. To register on a mobile or tablet device, please click here. After you register, please test your system through the link provided to ensure you have a smooth start to the event. Please be patient when testing your system as the test audio and video stream may take several minutes to load. If you cannot hear the test audio or see the test video after five minutes, please read our webcast help page or contact your system administrator or BBI at eConference@bbi.catholic.edu.au or +61 2 9847 0578. If you have any questions about the upcoming eConference, please contact Amelia Morris on 02 9847 0578 or econference@bbi.catholic.edu.au. This entry was posted in Uncategorized on April 14, 2015 by ACBC Communications.